The Opposition St.Kitts Nevis Labour Party cancelled their heavily promoted protest march scHeduled for Friday afternoon through the streets of Basseterre. 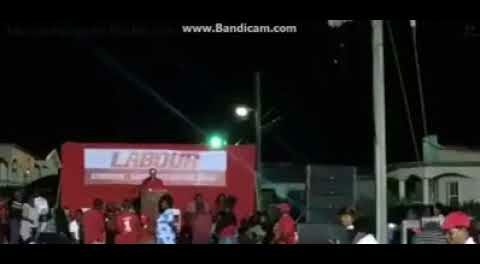 The announcement of the cancellation was made late Friday morning after the candidates took to the platform at a poorly attendEd public meeting on Thursday evening and invited the less that 50 persons present to come out to March in the planned Friday Afternoon protest. Unconfirmed reports from fairly reliable sources have indicated that the SKNLP Executive called an emergency meeting on Friday morning . The meeting’s only agenda item was to ascertain whether or not the SKLP would proceed with the planned march. Due to the poor turnout at the Thursday night meeting in Lime Kiln which followed a series of poorly attended SKNLP Public meetings in St.Peters and Market Street leading up to the Labour Day march, the SKNLP executive decided against staging the march as they feared the distinct possibility of another poor showing. The party has been trying to kick-start their Election campaign for some weeks now. With the Partt Conference on Sunday the hope was to use the rally and .arch to help mobilise support for their annual convention slated for Sunday May 20th. They have yet to announce their full slate of candidates as the party has been having major issues attracting persons willing to run on a SKNLP ticket. To date only 5 candidates have been declared.